President Felicitaded The Rugby Stars at the Caltex Rugby Awards. | Welcome to Chevron Lubricant Lanka PLC. » Sponserships » President Felicitaded The Rugby Stars at the Caltex Rugby Awards. President Felicitaded The Rugby Stars at the Caltex Rugby Awards. 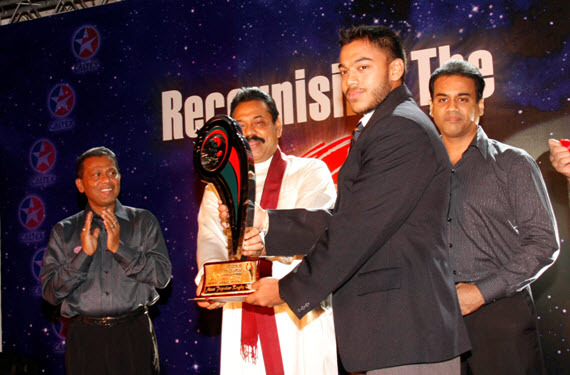 Thursday, 18th March 2010: For the first time in the history of the sport, Rugby Stars were felicitated by His Excellency President Mahinda Rajapaksa when he graced the “Caltex-Observer Touchdown” Rugby Awards organised by Chevron Lubricants Lanka PLC. Event held on the 26th of March 2010, presentations were made to the Most Popular Ruggerite for 2009 and the Most Popular Rugby Club for 2009. The selections were made through the competition which was jointly held with the Associated Newspapers of Ceylon Limited during the months of May to September last year where readers were encouraged to vote for their preferred club and ruggerite through coupons that appeared in the newspapers. Additionally, awards were also presented to winners in six other categories based on selections made by the Sri Lanka Rugby Football Union. The categories were for the Best Captain, Best Forward, Best Three Quarter, Most Promising Young Player, Best Player and Best Team. Chevron Lubricants Lanka PLC has long supported the game of rugby in Sri Lanka. As the sponsors of the ‘Caltex Inter Club League’ and the ‘Caltex Clifford Cup Knockout tournaments’, the organisation has been one of the key driving forces behind the success & development of the game over the last decade. “Activities such as the Caltex Observer Touchdown Rugby Quiz’ are initiatives by the organisation to generate further interest in the game and provide sports fans further opportunities to be involved with the game” added Mr. Gomes.